micro nutrients: copper (Cu), iron (Fe), manganese (Mn), molybdenum (Mo), zinc (Zn), boron (B), and of occasional significance there are silicon (Si), cobalt (Co), and vanadium (V) plus rare mineral catalysts. The nutrients required for healthy plant life are classified according to the elements, but the elements are not used as fertilizers. Instead compounds containing these elements are the basis of fertilisers. The macro nutrients are consumed in larger quantities and are present in plant tissue in quantities from 0.15% to 6.0% on a dry matter (DM) (0% moisture) basis. Plants are made up of four main elements: hydrogen, oxygen, carbon, and nitrogen. Carbon, hydrogen and oxygen are widely available as water and carbon dioxide. Although nitrogen makes up most of the atmosphere, it is in a form that is unavailable to plants. Nitrogen is the most important fertilizer since nitrogen is present in proteins, DNA and other components (e.g., chlorophyll). To be nutritious to plants, nitrogen must be made available in a “fixed” form. Only some bacteria and their host plants (notably legumes) can fix atmospheric nitrogen (N2) by converting it to ammonia. Phosphate is required for the production of DNA and ATP, the main energy carrier in cells, as well as certain lipids. 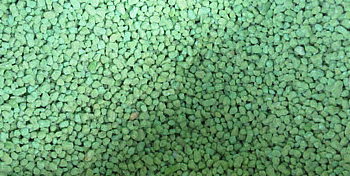 Fertilizers are any solid, liquid or gaseous substances containing one or more plant nutrients in known amount, that is applied to the soil, directly on the plant (foliage) or added to aqueous solutions (as in fertigation) to maintain soil fertility, improve crop development, yield and/or crop quality.